Take a break to Western Australia aboard the Indian Pacific before a leisure cruise through Margaret River aboard the Sea Princess. Gaze across the Nullarbor from your private cabin onboard Indian Pacific. Take an overnight in Perth to relax before boarding your cruise. Explore Margaret River and Albany from the Sea Princess. 2 nights aboard Indian Pacific travelling from Adelaide to Perth in Gold or Platinum Service. Includes all meals, drinks and off train excursions in Cook and Nullarbor. 1 night stay in Perth at Pan Pacific Perth including breakfast. 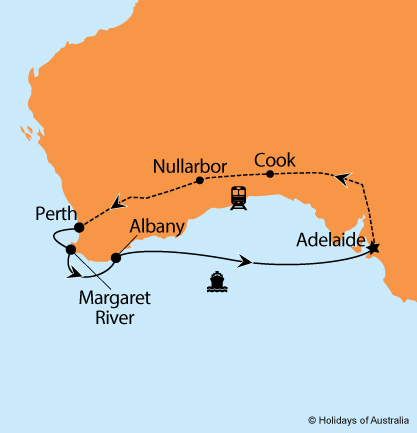 5 nights aboard Sea Princess cruising from Fremantle to Adelaide with port calls in Margaret River (Busselton) & Albany. Your cruise includes onboard meals and entertainment. Images courtesy of GSR, Tourism SA, Tourism Australia & Princess Cruises.